Bar carts can make coming home after a long workday a more pleasant experience. Perhaps that's why they've become so popular. Not only are these carts functional at serving up a soothing nightcap, but they also make a bold statement and come in many shapes and sizes. Regardless of the type of cart you own, make sure to stock your bar cart with all the essentials. These DIY bar cart accessories will help inspire you to rethink how you display your favorite cocktail ingredients. This first bar cart accessory is extremely simple to create because all that's needed are some glass bottles and vinyl lettering. Think about what type of bottles you want to be labeled. Some suggestions include water, seltzer, or booze. All you need is a little adhesive vinyl to transform ordinary glasses into a sparkling new set. Create any kind of pattern you like for personalized matching glassware. While this tutorial walks you through the step-by-step process using champagne flutes, there's no reason you can't apply the same instructions to other glassware. Bitters are making a comeback as more and more people attempt to make craft cocktails at home. Save yourself some money and get really personalized by making your own batches of bitters at home. To add a bit of style, stock them in your bar cart with custom printable labels. This DIY is reserved for those nights when you'll be entertaining because it has a short shelf life. However, if you want to impress your guests and the occasion calls for it, this frozen wine bucket will become a prized conversation piece. The best bar carts have some type of art or signage accompanying all the basic bar supplies. Create your own lightbox to have the option of changing out your bar cart messaging with each season. Stocking some reusable bar towels is a smart idea so you can quickly wipe up spills and messes as they happen. These watercolor cloth napkins will work well with bar carts that are more whimsical and colorful. Wine charms are cute but can get annoying when you have to remove them before washing the wine glasses at the end of the night. Try out some chalkboard paint instead. Though this bar cart accessory isn't dishwasher friendly, you should be washing fragile wine glasses by hand anyway. 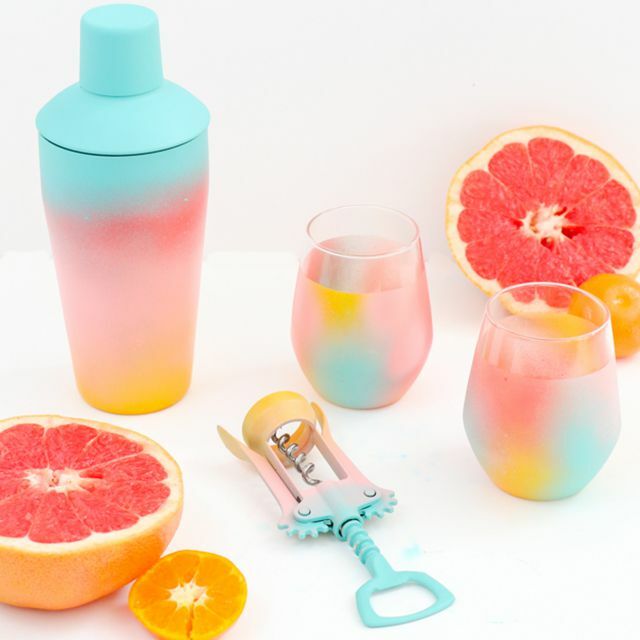 This colorful ombre paint effect will work on numerous bar car accessories like glasses, cocktail shakers, and even wine bottle openers. Depending on your color scheme, choose 3 to 4 shades that work well with one another. Any more than four colors can start to look too busy. Adding wall art to your bar cart setup is a must. However, if you're not artistically inclined, this can pose as a bit of a challenge. The easiest way to add art is by downloading some free printables that appeal to you and popping them in some inexpensive frames. Create a collage on the wall or opt to have one accent piece sitting on the cart. We showed how to label smooth glass bottles with vinyl lettering earlier, but that idea won't always work with decanters. Some crystal decanters don't have a flat edge, so it's difficult to adhere anything to the glass. Instead, consider making tags like these to keep all your spirits in order. If you plan on restyling your bar cart often, then you'll want to have a variety of different coasters to rotate. This DIY project is simple and inexpensive, so you won't feel bad if the coasters get ruined after a while. There's no need to get overly complicated with the doodling. If you're not the best artist, stick to polka dots and arched stripes.